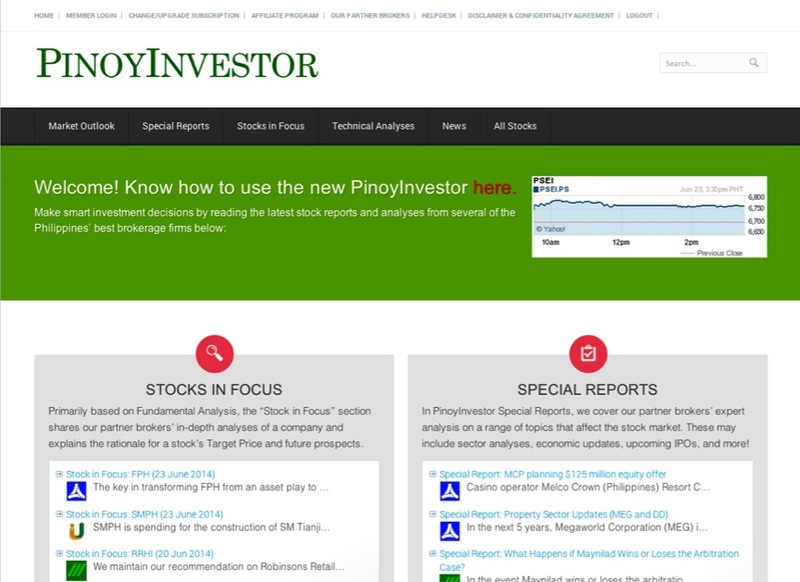 PinoyInvestor | Make smart investment decisions. Stock Rankings and Buy/Sell/Hold Recommendations! With PinoyInvestor, you get ALL these great benefits! Want to buy stocks with the highest upside potential? 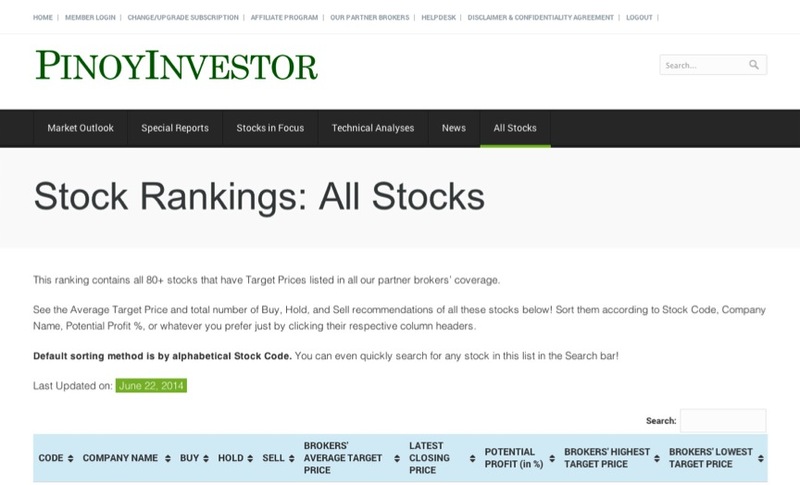 See ALL 80+ stocks that our partner brokers cover and rank them according to Potential Profit %, number of Buy recommendations, and more! Which stocks are recommended by all brokers that you buy? That you sell? See their consensus Buy/Sell/Hold recommendations to make more profitable and less risky trades! Want to invest in stable blue chips OR riskier but high-yielding stocks? Either is fine because you'll see 3 sets of stocks - PSE Index, Growth/Value, and Speculative Stock Picks - that you can sort and rank yourself! Not only will you get our expert brokers’ stock reports and analyses, you’ll also see these stocks’ target prices! Know their fair value so you can buy and sell at the right price! 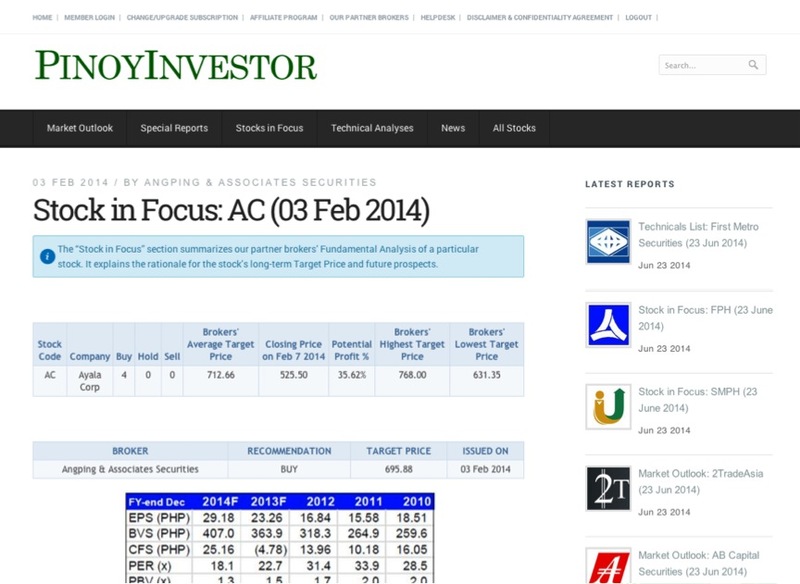 Get stock analysis, reports, and recommendations suited for long-term investing! 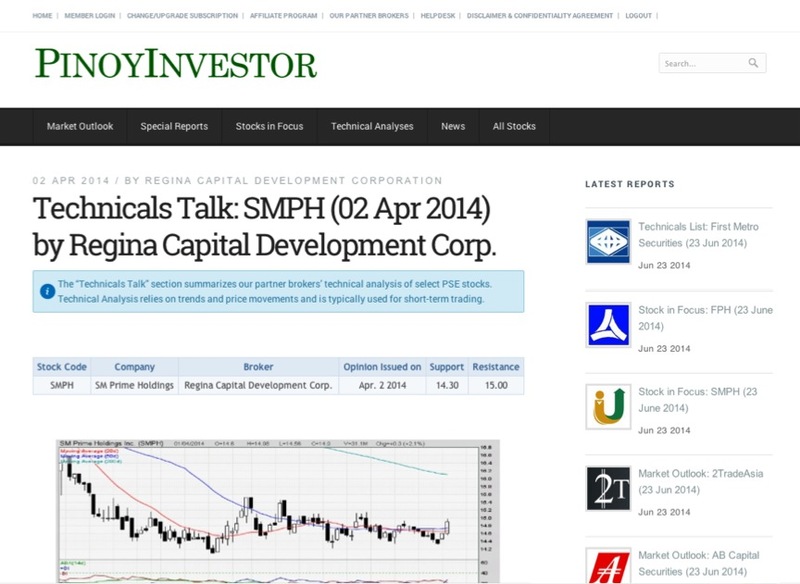 Get access to ALL of the NEW and historical Fundamental Analysis of our partner brokers on A LOT of PSE stocks! Want short-term trading over long-term investing? 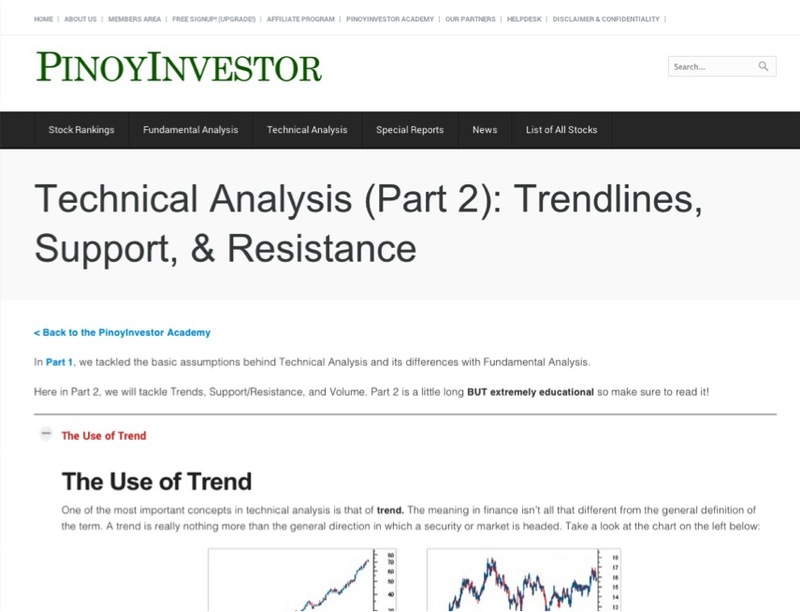 Check out our partner brokers’ technical analysis, support/resistance levels, and chart pattern analysis on the PSEi and PSE stocks! Continuously make better investments! Get FREE access to ALL our educational materials on stock market investing in the PinoyInvestor Academy! Share PinoyInvestor to friends and earn money! We’ll reward you up to P1,300.00 outright commission for every person you refer to a Premium Access subscription! On top of the outright commission, you get to earn month after month every time your referred affiliate renews subscription! That's passive income for you! 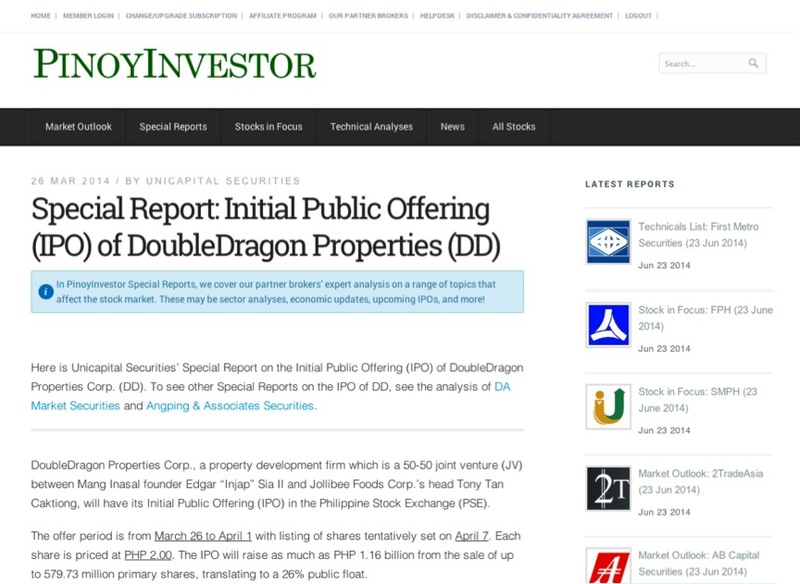 The most extensive source of expert stock market research, reports, and analyses! Join THOUSANDS of satisfied PinoyInvestor members! Since becoming a member, I have profited more than P25,000 in realized gains. The analysis of your several partner brokers indeed is an advantage compared to the single analysis from a broker. Also, I have about P40,000 in unrealized/paper gain, so double thanks to you, PinoyInvestor team! You guys are awesome! I love reading your articles and will continue doing so forever (or as long as you are publishing)!! Happy investing! I just want to thank PinoyInvestor. It has helped me a lot in choosing what stocks to trade. I've been getting bigger returns lately. Glad I decided to upgrade my subscription after how many months of just getting it for free. Actually, OK po siya. I never thought I would learn so much about stocks! Buti nalang free yung resources sa Academy hehe. Upon sign-up, you’ll instantly get access to ALL the FREE research, reports, and analyses from our expert partner brokers!